a. 1lb ground beef, chicken, or turkey seasoned your favorite way and browned on the stove-top! 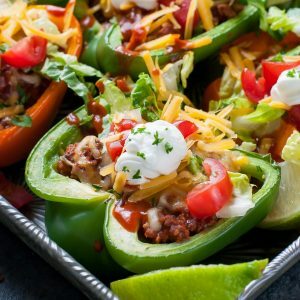 I use a combination of enchilada sauce (homemade or store bought) and homemade taco seasoning to flavor mine, plus a little mexican hot sacue for a kick! You can also make your protein option in advance and keep in the fridge for 2-3 days or freezer for emergency taco night filling. This also works with my lentil-veggie taco filling too!